Click on images for enlarged views. Left - photosphere, Middle - chromosphere CaK (394 nm), Right - H-alpha chromosphere (656 nm). ​There are two layers of the sun that can be observed outside of a total solar eclipse; the photosphere (sphere of light) and chromosphere (sphere of color). The photosphere is 100,000 times brighter than the chromosphere. The blindingly bright photosphere can made safe to observe or image with relatively simple (hence inexpensive) broad-band “continuum” filters. This allows one to observe sun spots, granulation, and faculae. Within the bright continuous spectrum of the photosphere there are specific absorption lines from various elements. 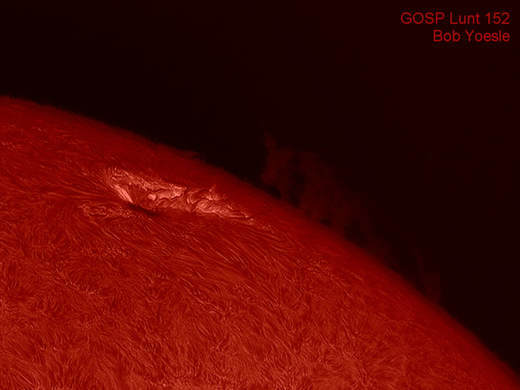 Identical wavelength but narrower emission lines originate higher above the photosphere in the chromosphere. Therefore, observation of the much dimmer chromosphere requires the use of very narrow-band filters in order to look at specific emission spectral lines contained within the underlying photosphere absorption line, while at the same time not allowing any adjoining continuum from the photosphere through. The most interesting emission lines of the solar chromosphere are the Hydrogen alpha (H-alpha) emission and the Calcium K-line (CaK) emission. These filter systems allow one to observe and image prominences, flares, filaments, plage, and other dynamic features. These filters are made of a complex stew of "interference" and other types of filters, and hence are much more expensive compared to simple continuum filters. Never look at the Sun without filters approved for solar observation - instant and permanent eye damage may otherwise occur. Both continuum and chromosphere filters need to have very good blocking (OD5+) of ultraviolet and infrared wavelengths to be safe for visual use. 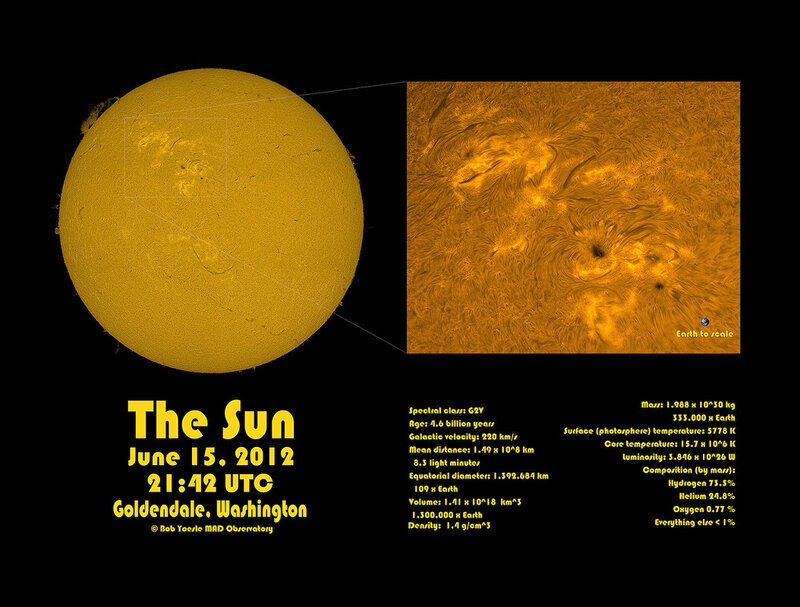 ​June 12, 2012 full disk and close-up of an Active Region in H-alpha with Earth to scale. Available as a poster with solar vital statistics for educational purposes. May 31, 2014 at the Fiddlin' Under the Stars Bluegrass Festival. 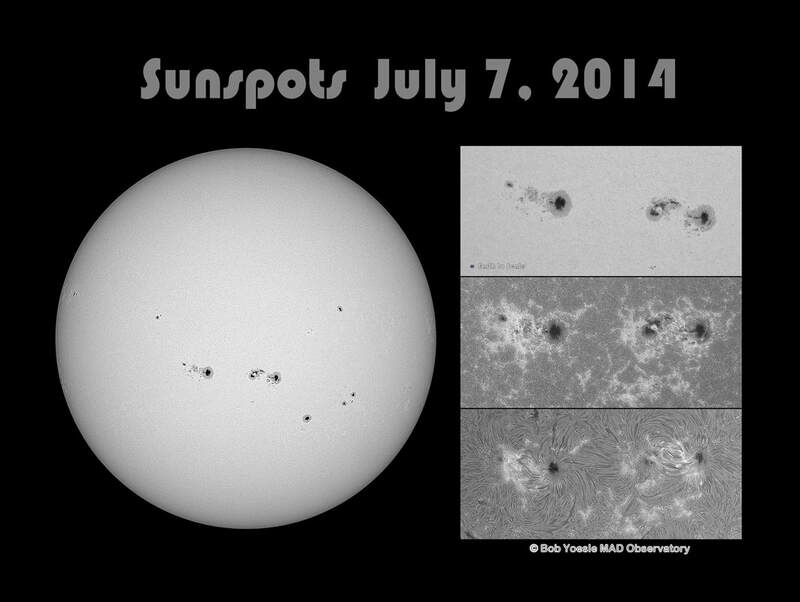 Some of the largest Sunspots of Solar Cycle 24 -- many times larger than the Earth -- appeared in July 2014 crossing the face of the sun. 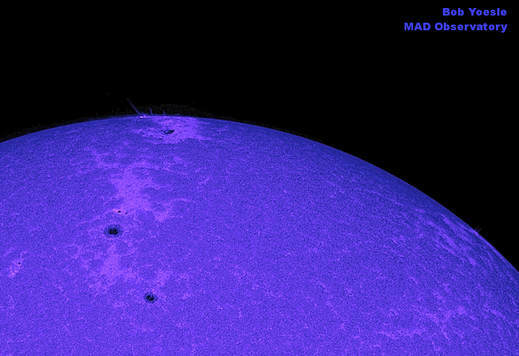 Active Regions 1209 & 1208 are shown in the close-ups in white light (photosphere), as well as ionized Calcium and Hydrogen (chromosphere). ​The deep red glow of the Sun's chromosphere in the light of Hydrogen is at a temperature of 15,000 degrees Celsius (27,000 F). These features are constantly changing, and no view of the sun is ever the same. The deep violet glow of the Sun's chromosphere in the light of Calcium is at a temperature of 20,000 degrees Celsius (36,000 F). 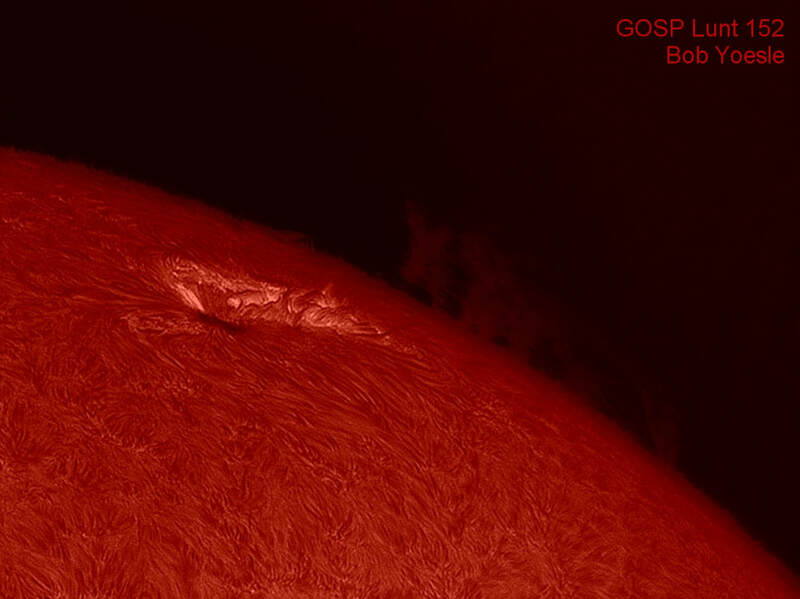 Faint prominences can also be seen being ejected from an active sunspot region. Mosaic of the Sun's chromosphere in the light of Hydrogen taken under good to excellent seeing conditions showing intricate detail. 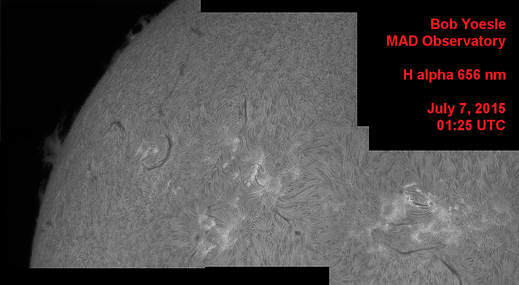 Prominences can also be seen being along the Sun's limb, some of which are slightly blurred due to their motion during the exposure. 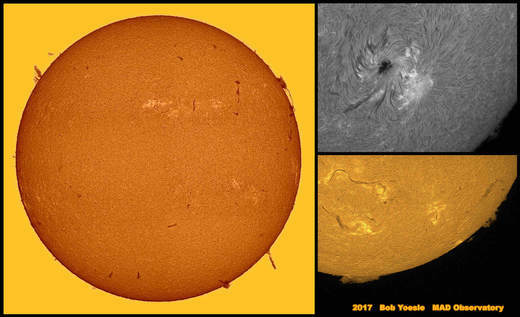 Montage of the Sun in the light of the Hydrogen alpha emission. The full disc image was processed to show prominences as dark features, demonstrating they are the same phenomena as the "filaments" seen against the disc itself. The August 21, 2017 total solar eclipse showing the "diamond reign effect" just prior to and after totality. 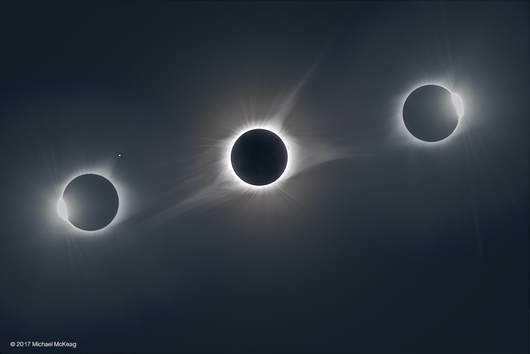 Only visible during totality, the magnificent outer atmosphere of the Sun known as the "Corona" is spectacular to behold. 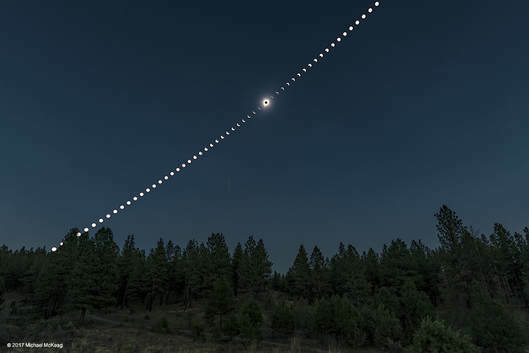 The August 21, 2017 total solar eclipse showing multiple exposures capturing the partial phases, as well as totality and the surrounding landscape.